Charles Carroll Handford, 86, of Batesville died Saturday, August 26, 2017 at his home. Born December 3, 1930 in Newport, AR, he was the oldest child of C.D. and Charlotte Handford. He grew up in Batesville and attended Batesville High School. 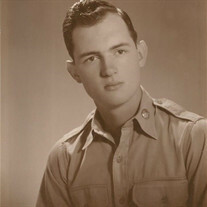 He joined the National Guard in 1949 and served in the Army during the Korean Conflict. He was a longtime employee of the Batesville Guard. An early marriage to Ruth Long of Desha produced one son, Mark. He married Mildred Stone of Calico Rock in 1960. They were married for 51 years until her death in 2011. They had 4 children. Survivors include 4 sons, Mark Handford and wife Susan of Greenbrier, AR; Bart Handford and fiancé Ginger Jeffery of Little Rock, AR; Ben Handford of Fayetteville, and Brant Handford and wife Kathy of Batesville; and one daughter, Anne Mills and husband Jeffery of Jasper, TN. He is also survived by 4 grandchildren, Amber Styers of Greenbrier; Taylor Handford of Little Rock, and Chase and Connor Handford of Fayetteville, as well as 2 great-grandchildren, Hayden and Easton Styers. He also leaves behind one brother, Stanley Handford of Fairfield Bay, and 2 sisters, Harriet Eaton and Ellen Dunn both of Batesville. A graveside memorial service will be held Saturday, September 2nd at 11 AM at Oaklawn Cemetery. In lieu of flowers donations may be made in memory of Mr. Charles to the Independence County Library or Watson Creek Veterinary Clinic.